The Nightcore P10 is described as a compact, tactical flashlight, specially designed for military, law enforcement, and home defense. As a security professional, I was glad to take advantage of a nice discount price at a gun show last August to evaluate this product. Accessories include a clip, lanyard, and a belt holster. In my mind, the biggest feature of the P10 is the dual mode switch. There is a standard switch to turn the light on/off and a secondary switch for strobe mode. It is quite easy to differentiate the two entirely by feel. For low-lilght operation, I like the fact that the unit can be placed into a particular mode and always come back on in that mode. It is not necessary to fully depress the light switch; only the slightest pressure is required to turn on the beam. This is ideal for moving in low-light situation where I want a brief flash of light with minimal effort. 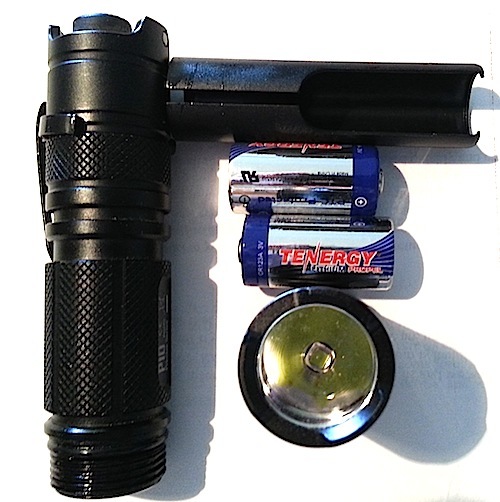 The clip and overall thinness of the flashlight make it easy to place in a variety of pockets. In six months of operation, I’ve only experienced the clip coming off the light one time. The belt holster is barely adequate and clumsy to use from underneath a jacket or sport coat. Although there are anti-roll indentations on the flashlight body, the clip seems to keep the light in a constant orientation throughout a work day. Now, there are some pockets you do not want to use to store the P10. A friend recommended placing the light in the knife pocket of 5.11 Stryke pants. I have two pair, so I tried it one evening. It’s too easy to set off the strobe when sitting down and you will feel it pretty soon. I leave mine in Turbo mode and the light gets quite hot after barely fifteen seconds of constant operation. I did, however, obtain about six months of use from the factory batteries from Aug. to Feb. Here is how the unit breaks down. The body tube in which the batteries are contained is long enough to accommodate 18650 cells. 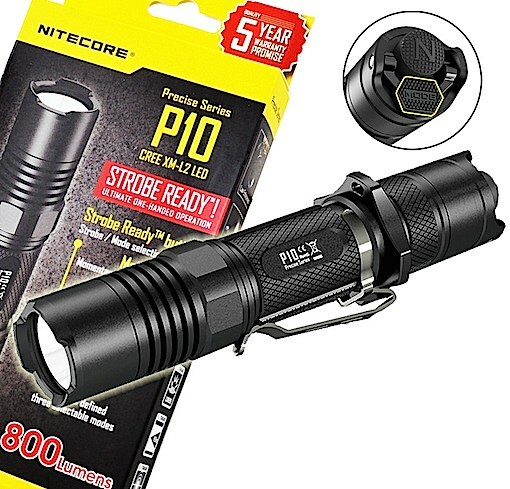 If found the Nightcore P10 to be superb for indoor low-light operation and more than adequate for most outdoor operations in terms of beam throw. Ease of use is quite good and I really like the strobe operation. As of the writing of this review, the Nightcore P10 is available on Amazon for $55, which based on my experience is excellent value for the dollar.